I assume you would just double the ranges. Does anyone play this scale? I would probably play a squad based game, such as Nuts!. I would imagine that the size of the table needed to play a platoon on platoon game at that scale would be more than is available to most people, and reaching across would be a pain. I do, but I use my own rules. I'm too old to play on the floor anymore, but we did, years ago. My rules are more skirmish. Each figure is one man. We play with a couple of hundred figures, 20+ tanks, etc. It's a blast, and it's cheap! Realistic weapon ranges are not possible -- they're just too big. I recommend setting up sheets of plywood, on saw horses, in your garage. You can leave 2-foot wide walkways in between the sheets, to allow access. Measure to the edge, pick it up at the same location on the next board over, and continue as if the gap is not there. It will take a little practice, but it will work, and you won't be crawling on the floor! Visit the Combat Storm web site for some free building/terrain downloads. They have some others for sale -- they are all great! Worth your money -- remember that the figures for your games, are dirt cheap, so spend your excess hobby funds on some PDF building downloads. Cheers! out a Lot of Terrain, Works Great with 2X Ranges. 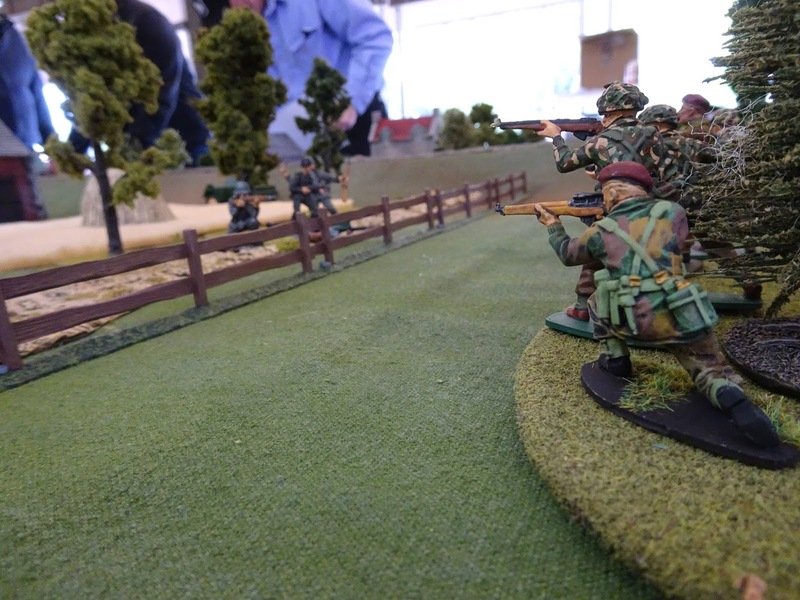 I have gamed Bolt Action in 54mm successfully on a 6ft x 4ft table. Initially people are surprised by this, but with plenty of terrain and realistic numbers the games are all great fun and run at a lively pace. Probably the most fun WW2 games I've had since I was a kid! The first game was US infantry vs Germans just inland from Utah Beach on DDay. I kept the ranges as per the rules and just explained it down to smoke reducing range. The only anomaly was dealing with the German MG in the Church tower. At the height of the church (it's the Conte one) normal range wouldn't touch the ground. I just said that all range measurements were done along the ground. Made it easier. The only rule changes I used were to allocate the dice per Officer and NCO with an additional dice allocated for the US to simulate their drive and initiative and reducing the Germans by one to simulate the shock of a sudden attack and disorganisation. Seemed to capture the larger character of the game a bit more. Great fun, so much so that I only game WW2 in 54mm now. Here are some pictures. Please excuse me if they don't work too well as I'm a bit new to this. Nice, Comicbook Hero! Gorgeous terrain, figures, and painting. Thanks for sharing. As you stated, reduced LOS is a great way to reign in the long ranges of weapons. It can mean that every shot is always fired at "Short" range, but it can be done. I love gaming in 54mm scale. It's a hoot, in many ways. Cheers! Comicbook Hero BIG Congratulations on your pictures, very Good Job, Looks like a Fun Game also --- Hope to put some Pic's of my 54mm Bolt Action Game, next one we play here, we do mostly 1000 pt. games so we have usually 1 to 3 or 4 AFV's in our Battles that really show well in the Pictures. However, I can't take credit for painting all the figures. Some are Pre painted metal Conte figures. 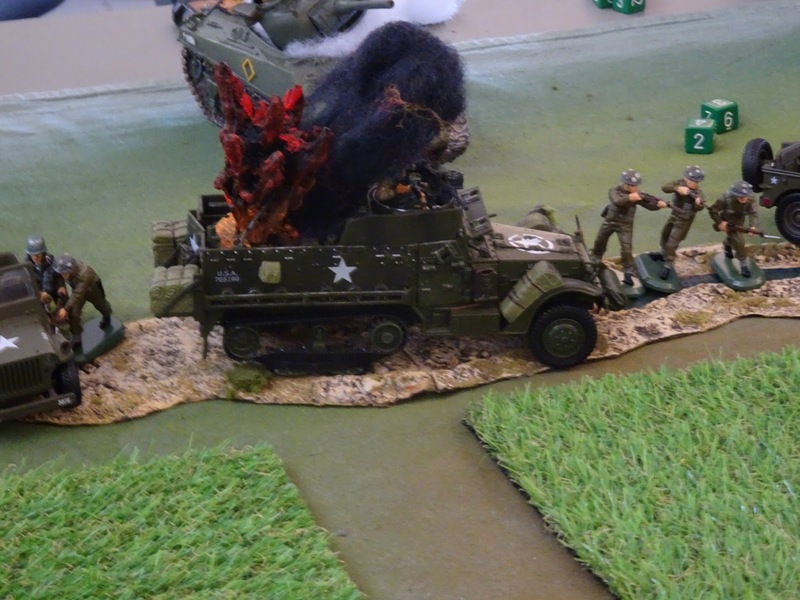 I blame 54mm figures for killing off my other scale wargaming! Once I had seen some Conte WW2 on the web and some Armies in Plastic French and Indian Wars Indians I just couldn't get the motivation to paint or game anything else. SGT you are right, games just seem more fun and full of character. Never had a bad or boring one yet. Ron, I'd love to see pics of your game. Table, troops, and terrain from Ron's collection. Photos by the extremely talented Ray M.
Looks like it was a great game. As to the original question – yes, we, the Skirmish Wargame Collective in the UK, do. They work very well, no changes to distances. Will try to load some photos of some of our games. We are just about to venture into Vietnam, using adapted BA to include the different weapons etc. 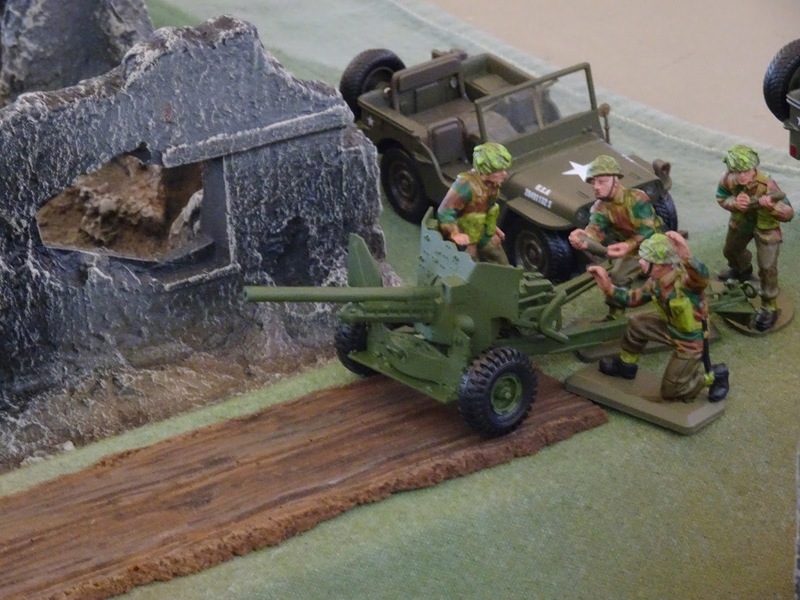 We bought up a lot of John Landers WW2 kit (see articles in WI)and we use BA almost all the time on a 12x 6 table with lots of scenery and no range modifiers apart from pistols, panzerfausts and Piats. Here a couple of photos from a Nuts! game in 1/32 scale. Thanks to Comicbook Hero's photos for starting me off collecting this scale. I plan to use Bolt Action for my next game. Has anyone experimented with smaller squads – say six instead of ten? Also, any tips on how much armor to employ? Seems like armor could easily take over the game table. I plan on gaming the British Paras holding out in Arnhem, plenty of ruined houses, street fighting and dangerous ground for the German tanks due to the close quarters. At this scale, one could easily and readily use the garden.